Every summer, my lips get insanely dry after I spend time in the sun. I try to remember to use a lip balm with sunscreen, but I usually forget to use it. My lips get dry, which makes my lipstick look awful. I've found that the best way to take care of my lips is to use a lip scrub once or twice a week. Good Earth Beauty recently sent me a set of 3 scrubs in yummy ice cream flavors, and I loved them so much that I want to giveaway a set for one of my lucky readers! 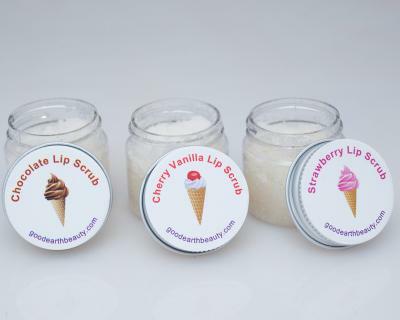 I received three Good Earth Beauty Natural lip scrubs in ice cream flavors: chocolate, strawberry, and cherry vanilla. Each one is 1 ounce, so they can be used several times to keep your lips kissably soft. They exfoliate the dead skin off of your lips and moisturize with several oils, including organic coconut oil, organic sunflower oil, organic jojoba oil, organic almond oil, and organic shea butter. Some of the ingredients are organic, and all of them are natural. This means that you can pronounce every ingredient in the scrub! Good Earth Beauty will send one set of their natural lip scrubs to one of my lucky readers! Contest is open to US residents 18 years and older. Good luck!